Published: Oct. 23, 2017 at 02:01 a.m. Updated: Oct. 23, 2017 at 11:06 a.m.
SANTA CLARA, Calif. -- Last Tuesday, Ezekiel Elliott was granted a temporary restraining order, at least partially thanks to a judge's vacation schedule. Five days later, there was no restraining Elliott, and the San Francisco 49ers essentially began their offseason more than two months ahead of schedule. In a comprehensive beatdown that served notice to the NFL world that reports of their demise have been greatly exaggerated, the Dallas Cowboys rolled to a 40-10 victory over the Niners in front of 70,133 fans, with their sublime second-year running back inflicting much of the damage. 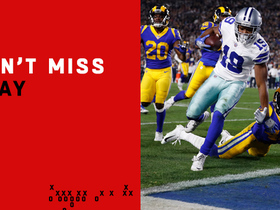 Elliott ran for a pair of touchdowns before the midpoint of the first quarter, putting winless San Francisco in a hole, then completed the burial on the Cowboys' first offensive play of the third quarter, turning a short screen pass into a 72-yard scoring jaunt. The latest twists and turns in relation to his playing status didn't seem to faze Elliott; if anything, he was hyper-focused on the task at hand. And the Cowboys, operating under the Use Him Until You Lose Him premise, were locked in from the jump and happy to hand Zeke the keys. "Of course it fires you up when Zeke goes out and does that," star receiver Dez Bryant told me shortly after Sunday's victory. "He's the workhorse on this team, and we're gonna be behind him 100 percent. He wouldn't be human if all this didn't affect him, but at the same time, he's performing at a high level. "I love Zeke. I love the fact that he blocked all that bulls--- out. 'Cause that's what it is: bulls---. And he knows what he means to us." With Elliott as the catalyst on Sunday, the Cowboys -- still two games behind the Philadelphia Eagles (5-1, pending Monday night's game against Washington) in the NFC East -- suddenly resembled the relentless team that powered its way to the best record in the conference last season. The victory over the Niners (0-7) was the stylistic opposite of Dallas' 42-17 Week 2 drubbing at Denver in which the Broncos held Elliott to a career-low 8 yards. 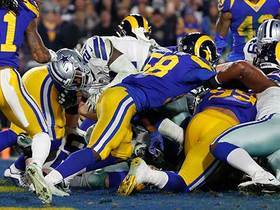 If that fiasco caused concern in North Texas, the stress was exacerbated by a pair of close defeats at AT&T Stadium in October, first to the surprising Rams and then to the amazing Aaron Rodgers and the Packers, the latter outcome mirroring last January's Divisional Round playoff disappointment. Suffice it to say that Sunday's resounding victory was like a giant can of aerosol air freshener unleashed in a musty gym. "It was really big for us to do this," Elliott said. "Then again, we're two two-minute drives away from being a 5-1 team. But yeah, I think it's important to start early and feed off that. We know what type of talent we have." During their two-week break, the Cowboys talked about rediscovering the formula that worked so well for them throughout much of 2016. "We felt like this was an opportunity to start fast and get control of the game," said veteran tight end Jason Witten, who hauled in a one-handed, over-the-shoulder, 18-yard touchdown catch to put the Cowboys up 20-3 with 10:26 remaining in the second quarter. "When we're at our best, that's how we play. It's a new year, but it would be nice to get back to what we were doing so often last year and completely dominating games." On a day when the 49ers honored an ailing former star, Dwight Clark -- and his signature moment, "The Catch," that vaulted San Francisco to an epic 1981 NFC Championship Game victory over the Cowboys, launching a run of five Super Bowl victories in 14 seasons -- it was the visitors who came out emotionally charged. With the Niners' rookie coach, Kyle Shanahan, seeking his first career victory, and rookie quarterback C.J. Beathard making his first-ever start, all suspense was swallowed up in the game's early stages. 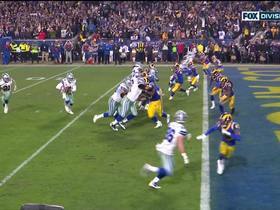 It was over when Elliott took a swing pass from fellow second-year star Dak Prescott (16 of 25, 234 yards, three touchdowns, no interceptions, and a two-yard TD run), got a terrific sideline block from All-Pro guard Zack Martin and slipped his way up the sideline and into the end zone for a 72-yard score. "That's the same screen pass we scored on last year against Pittsburgh," Elliott said. "When guys downfield are getting blocked on any screen, it's a chance to get a touchdown." Elliott's effort clearly galvanized his teammates, including a fired-up defense that harassed Beathard into a pair of lost fumbles off strip-sacks and even saw one of its starters, safety Jeff Heath, kick an extra point (as the fill-in for kicker Dan Bailey, who went out with a groin injury in the first half). To coach Jason Garrett, none of that was coincidental. "When we can come out and run the ball like that, it makes everything work," Garrett said shortly before boarding the team bus more than an hour after the game. "We throw it better. We can get Dak on the move. The defense plays better. It's just better." Sustaining that blueprint, of course, may be compromised by Elliott's potential absence, something that could happen in Week 9, be further delayed by legal wrangling or potentially be vacated completely by a favorable decision. It's also possible that Elliott and the league could agree to a settlement which would reduce the suspension. Rather than being unsettled by such uncertainty, however, Elliott treated Sunday's game as a sort of safe haven. "He's done a great job of blocking it out, to be honest with you," Cowboys receiver Brice Butler said of Elliott. "He just stays even keel. For him, this is an escape. Out here (on the field), he doesn't have to deal with it." 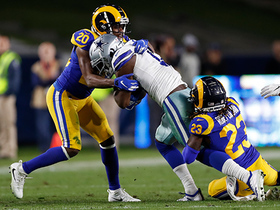 To Bryant, who caught a team-high seven passes for 63 yards, including a two-yard touchdown early in the fourth quarter, there's an obvious reason that Elliott appears to have rediscovered his comfort zone. "People don't see what goes on in our locker room," Bryant said. "We want to make it a great environment for him, and that's what we've created here. It's fun for him. He loves it in here." He certainly loved his Sunday in Santa Clara, in all its unrestrained glory.